Deluxe corner unit. Same great location and access to the slopes, pool and spa. 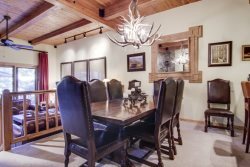 The Ridge #7 is a 3BR vacation condo (corner unit) in a small and cozy Snowmass Village community of 2 and 3 bedroom condominiums that offer skiers luxury accommodations and relaxation in a ski-in ski-out setting. Ski all day, play all night, or simply relax by your fireplace or in your in-home Jacuzzi. Located on Faraway Road in Snowmass Village, directly on the Village Shuttle line, The Ridge community is an exceptional location only 10 minutes from Aspen. There is beautiful mountain scenery and plenty of extra fun activities every season of the year including hiking, biking, golf, rafting, horseback riding, dining and shopping. Note: The office room has a designer fold-out bed and can be closed off to serve as the 3rd bedroom. Enjoy. Step outside of your vacation condo and for the perfect ski-in ski-out experience. Ski directly to the lifts that take you up to the incredible trails and groomed ski runs on Snowmass Mountain. The lifts are only about 400 yds away which means you are always close to your condominium.